If you keep up with developments on the fluoridation front, you’re likely aware that Portland, Oregon’s City Council opted for it, despite vocal opposition. Anticipating such an outcome, citizen activists had already mobilized to put fluoridation on the ballot, and it’s likely they succeeded. 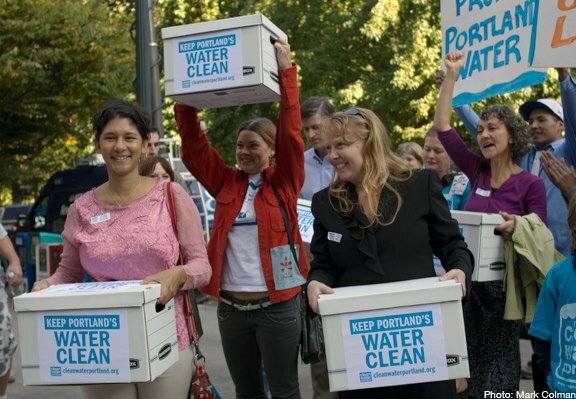 According to the Salem Statesman Journal, Clean Water Portland submitted more than double the signatures needed – more than 43,000 total – and a day before deadline, too! If the petitions are certified, the City Council could choose to put the issue before voters next year. Otherwise, the election would be in May 2014. It’s hard to imagine the council would put it to ballot any sooner than necessary, especially in light of recent news that its members met with pro-fluoride lobbyists yet failed to disclose those meetings as required. Promoted by then-Commissioner [now Mayor] Sam Adams beginning in 2005, the lobbying and reporting rules are supposed to preserve integrity in city decision-making. The requirements affect both lobbyists and city officials and are meant to reveal who attempts to influence city leaders – and on what topic. 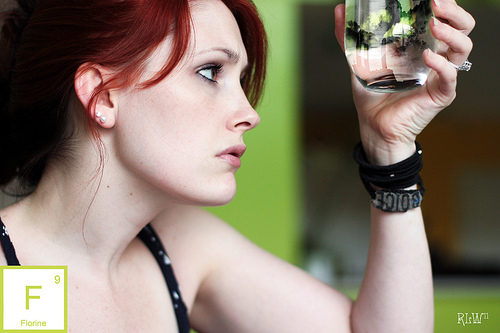 Upstream Public Health is behind the push to add fluoride to Portland drinking water. But its plan has since been challenged through a referendum effort that may block the City Council’s Sept. 12 unanimous approval. According to a recently filed disclosure, lobbyists reported meeting with Commissioners Randy Leonard on July 26, Dan Saltzman and Nick Fish on Aug. 2, Amanda Fritz on Aug. 6 and Mayor Adams on Aug. 27 to push for fluoride in public drinking water. But those same city officials –who are required to publicly post their calendars on a quarterly basis – either didn’t disclose the meetings about fluoride or left a vague subject heading. Adams and Leonard say they weren’t actually present at the meetings. None. And for obvious reasons: 1) You cannot control the dose, 2) You cannot control who gets it, and 3) It violates the individual’s right to informed consent to medicine. Fortunately, more people become informed every day and choose to take a stand for their right to choose. And education is what Clean Water Portland is focused on now. One teaching tool is the powerful documentary An Inconvenient Tooth, which was released at Portland City Hall just about a week before the council vote – and which you can watch in its entirety below. Learn more about Clean Water Portland. No evidence supports the assertion that artificial water fluoridation reduces social disparities in cavity incidence. Poor children are more apt to develop dental fluorosis (discolored teeth). Two potential adverse effects of fluoride, hypothyroidism and bone fractures, have been reported in scholarly journals. Fluoridation chemicals (fluosilicic acid) are contaminated with lead, arsenic and mercury, major health hazards for which no safe levels exist. It would appear that the effectiveness of artificial water fluoridation in the 21st century is at best questionable, given its fixed-dose medication approach, quality of fluoride used and its adverse impact on calcium metabolism and largely insignificant differences in dental caries experience between areas with artificial water fluoridation and those without. Rather than addressing the legitimate concerns of the public with regards to the ethics of fluoridation, pro-fluoridation activists dismiss anti-water fluoridation advocates as misinformed trouble makers intent on undermining public health. The increasing prominence of anti-water fluoridation groups globally, greater appreciation of natural and artificial fluoride sources and likely dangers of excessive fluoride consumption among some population(s) necessitate(s) a thorough analysis of the merits of water fluoridation. What other drug have we ever delivered through the public water supply? None. And for obvious reasons: 1) You cannot control the dose, 2) You cannot control who gets it, and 3) It violates the individual’s right to informed consent to medicine. The abstract of Awofeso’s paper, “Ethics of Artificial Water Fluoridation in Australia,” is available here. There’s an interesting double standard in medicine – dental and otherwise. Conventional practitioners can and do promote all sorts of treatments that haven’t been empirically proven or that work in ways we don’t yet understand. At the same time, many insist that “alternative medicine” isn’t valid because many of its treatments aren’t yet proven or understood. Yet when proof is provided, the tendency is to ignore it, discount it or move the goal-posts, holding traditional and natural healing practices to a higher standard than they hold their own. If we say there’s only one kind of medicine – that which works – then shouldn’t all of its premises and practices be held to the same standard? Science is not a body of knowledge but a process – a way of understanding the world through what can be observed, measured and tested. The tools of science are also always evolving, letting us see more – or more precisely – than before. What can’t be proven in one era may be proved in another as knowledge and technology evolve. What seems like magic to one generation may come to seem common sense to later ones. 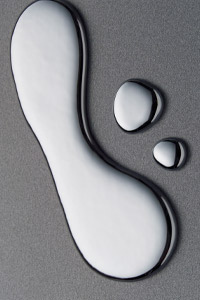 For decades now, conventional dentistry has put a large store of faith in fluoride. Fluoride toothpaste, fluoride supplements and fluoridated water have all been touted as important factors in preventing tooth decay. But research has helped our understanding evolve. We know now that ingested fluoride does little to prevent tooth decay yet contributes to a host of physical illnesses. We also see evidence that fluoride supplements may not be effective for children. But what about fluoride in toothpaste? A new study published in Langmuir, the journal of the American Chemical Society, raises some questions. In a study that the authors describe as lending credence to the idiom, “by the skin of your teeth,” scientists are reporting that the protective shield fluoride forms on teeth is up to 100 times thinner than previously believed. It raises questions about how this renowned cavity-fighter really works and could lead to better ways of protecting teeth from decay, the scientists suggest…. Scientists long have known that fluoride makes enamel — the hard white substance covering the surface of teeth — more resistant to decay. Some thought that fluoride simply changed the main mineral in enamel, hydroxyapatite, into a more-decay resistant material called fluorapatite. The new research found that the fluorapatite layer formed in this way is only 6 nanometers thick. It would take almost 10,000 such layers to span the width of a human hair. That’s at least 10 times thinner than previous studies indicated. 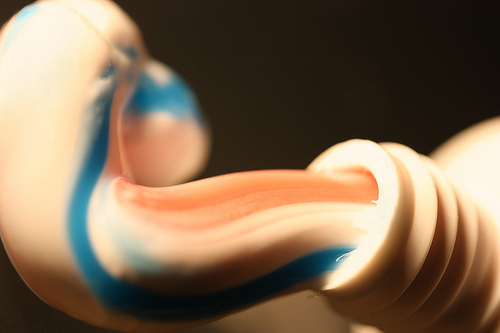 The scientists question whether a layer so thin, which is quickly worn away by ordinary chewing, really can shield teeth from decay, or whether fluoride has some other unrecognized effect on tooth enamel. 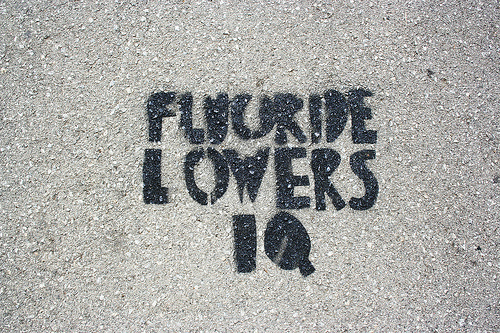 We might also ask, is it really the fluoride at all? For toothpaste really isn’t the biggest factor when it comes to good oral hygiene – which isn’t to say that it has no role. Its main role is to act as a mild abrasive to help break up the biofilm (plaque) that forms on your teeth between cleanings. (Toothpastes that contain elements such as antimicrobials play a dual role in supporting oral health, but their main function is still as an abrasive.) More important are things like brushing regularly and well, flossing and/or using a proxy brush – both of which have a much bigger impact on oral health than brushing alone. As a dentist, I do not use fluoride, nor do I recommend it to my patients. For hygiene products I do recommend, click here. Comments Off on Fluoride Works…How, Exactly?